So Thanks Giving was yesterday which always means holiday season has officially started, hasn't it? You can see sparkling, shiny and bright lights, clothes and decorations everywhere and it's always the time of the year when you love to wear festive clothes. Besides sequins, velvet is always my favorite. It's perfect for the cold season, it's soft and shiny just like everything right now. I had been searching for the perfect velvet skater dress in burgundy for quite a long time. Then I found this beauty which wasn't only a bargain. The quality's great and I loved its crushed velvet fabric. I picked my favorite belt and necklace in order to have some boho vibes in the look. I love the combo of silver shiny jewelry and velvet in burgundy, it looks so good! Wish you (and to all my awesome american readers hope you all had a beautiful Thanks Giving) weekend! There's nothing better than a velvet leggings for chilly days, I think those are even more cozier than jeans. On top of that they're 100 times more comfortable! Faux fur collar coat: Junim LA via Shop Van De Vort || Metallica tee: Urban Outfitters || Leggings: ASOS || Necklace: Vanessa Mooney & Urban Outfitters || Boots: Ash . It's ggggetting cccccold here you can feel winter in the air already, so here is my new winter coat for this year. I'm not a big fan of winter coats, so I only own a few (I usually buy one every year), but when I saw this one on instagram, I knew this one had to be mine. Even though it was quite expensive it was definitely worth it, it's perfect for layering because of its oversized fit and nice brown color. It's very 70s/boho inspired because of its huge faux fur shaggy collar which I totally love. It definitely keeps you super warm with a flannel shirt and knits underneath. When wearing jackets Iove doing necklace layering again, it's a great eye-catcher, especially with printed tees! Even in winter I prefer wearing leggings instead of denim pants, especially the leather look ones are sooo warm and leggings made of thinner material or tights are also possible when wearing a longer coat. Wish you all a great new week and maybe some sunshine, too. Outfit: I know your hopes and dreams they will collide. Here's an outfit a bit different to my usual outfits, it's less casual and more dressy/chic - you know that saying every woman should have at least one white blouse in her wardrobe? Maybe it's kinda true, but mine is very sheer (love wearing it with a black bra underneath - you know, Lana Del Rey style… ;D ) and I haven't worn it many times. I bought it secondhand, but it was actually sold at Primark. Primark always has some cool blouses and basics, you should check 'em out, they're true bargains. This is probably my fourth velvet skirt, but I didn't own a black one and it goes with everything. I love OASAP's velvet skirts, they're super cheap and the quality is the same as the quality of the very expensive ones. The whole combo is very grunge chic I guess - it's definitely different to my usual style, but sometimes I love trying something new. Fashion is the best way for doing that! Wish you all an awesome weekend. Outfit: The sky is falling, The sun is burning, A hallway to our eyes. That look is being thrown together with my favorite pieces I already have for at least 2 years in my wardrobe (no kidding!) - I remember wearing that camo jacket all summer long in 2012, it was one of my favorite cover ups for chilly nights. I still love it and I somehow rediscovered it, I always love when you have something hanging in your wardrobe and you almost forgot about having it and taadaaa there it is and you still feel the same joy as before while wearing it again. I think camouflage prints never get old, especially in autumn season they're always back in stores. I really love this one together with my red printed band tee and some washed blue denim cut offs - the combo is almost like a festival combo you can see at Glastonbury for example. "Gone Trippin" denim jacket: UNIF || Tee: Urban Outfitters || Necklaces: Dixi & TheVintageWillow || Mesh/leatherlook leggings: eBay (old) || Platform boots: Vagabond. Actually I have that denim jacket since last spring, but I wasn't able to wear it back then because it was usually too hot - now it's almost too cold, but I wear it with a cozy knit or warm flannel shirt underneath . I love jackets which got a printed back AND I love distressed details - so this jacket is straight from heaven sent, I guess haha. I think it's sold out already and not available anymore, so I'm really happy about grabbing one of the last pieces a couple of months ago. You can't go wrong with jackets made by UNIF, their designs are always edgy, cool and something you won't see in the streets daily. 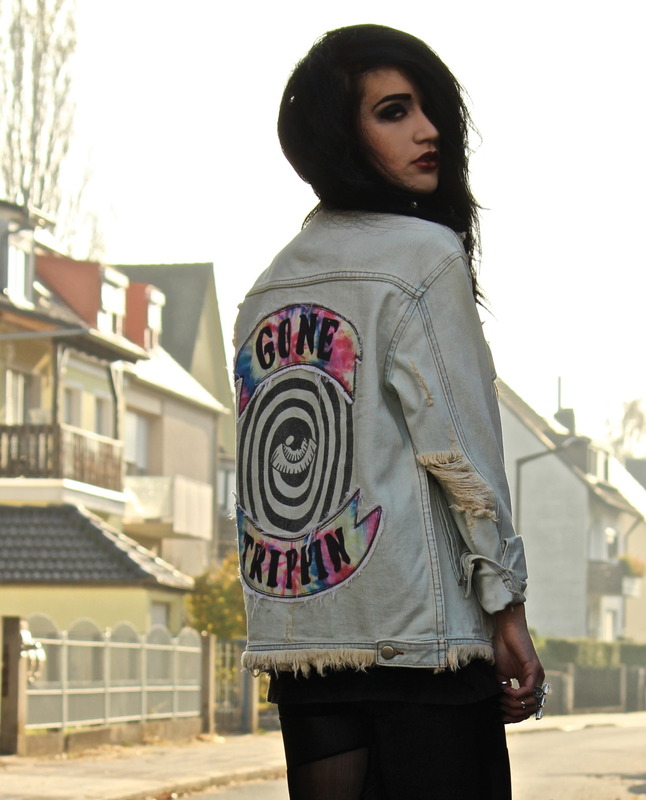 I think the jacket has a bit of a happy hippie vibe, I really like the tie-dye printed patches which say "Gone" and "Trippin" and the eye print looks so dope. The jacket is also kind of oversized and I hadn't owned a light blue jacket before - they always looked a bit boring to me, this one definitely not! It's too cold for shorts most of the time the last days, so I'm wearing my leggings again. If you're not a fan of jeans like I (I don't know, they fit weirdly and aren't that comfortable.. they don't like my legs I think :-( ), I really would suggest you some leather look leggings in winter. They keep you warm, are super comfortable, fit like a glove and give your legs a nice silhouette. I always go for fabrics like "polyester", because those are way more comfortable than ones made of polytherane which is the same material used for faux leather jackets. It's mostly not stretchy at all and fits too baggy and not skin tight as it should. Outfit: Lost in the echo. Outfit: To The Night Sky.